Sorry I have been gone so long. 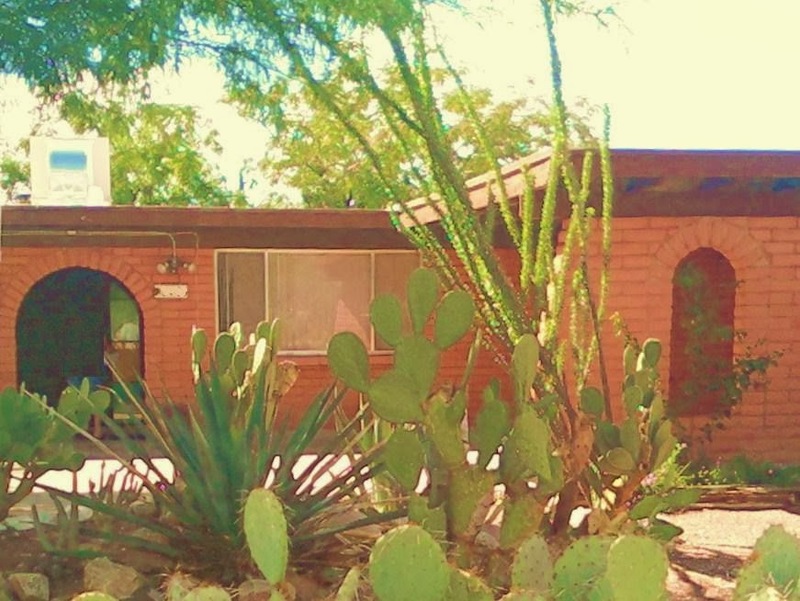 Moving out to the mobile home was an adventure especially since it is so unfinished. Then, yesterday my father passed away after a long struggle with Alzheimers. That means family is converging for the funeral on Saturday, but in the meantime, I have a few moments to give you all an update. My nephew and I loaded up the car with groceries and dogs last Thursday. My kitchen area is still in total disarray and I didn't even dig out the microwave until Monday. The first day of school went off without a hitch except that he was signed up for girl choir so his schedule had to be changed around. I took the day off and tried to put up some shade cloth but it was too hot to be working outside so I ended up putting together the table and stools. I hadn't heard back from the company that makes the table so I decided to keep it even though it is damaged because we really needed a table. I finally heard from them yesterday and they suggested that I take it back to Home Depot because the replacement part was not in inventory. I said I would wait 6-8 weeks because I did not want to take it apart after all my hard work. I wonder if the replacement part will ever show up. The straw seats are SO scratchy! What was I thinking? They definitely need covers. 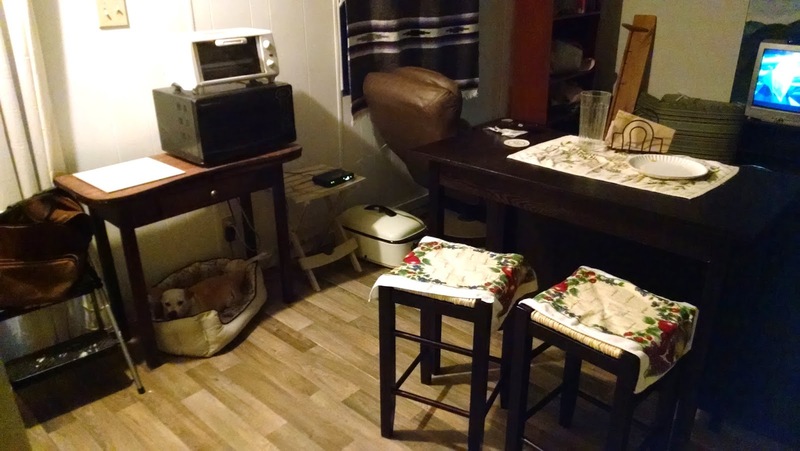 Here is my messy corner where my tools are still out for the remaining projects like cabinets and countertops, trim, shelves, etc... I am in serious need of storage solutions. Even some hooks on the wall would help me. 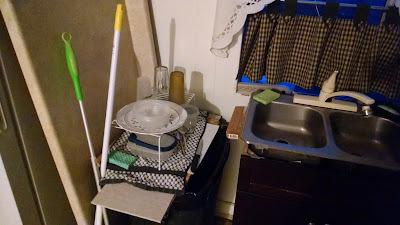 This is my little dish washing corner. Someday that countertop will be cut and secured. 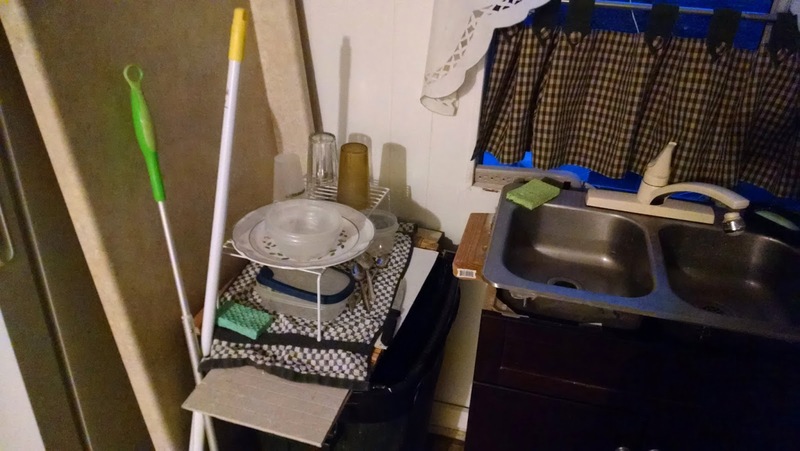 Until then, I am drying my dishes on a wire shelf over a trash can. I still have running water in this sink. The water tank is getting low so I got out my extension cords and found out they aren't long enough to reach all the way to the pool. My engineer co-worker offered to help me install an outlet by the pool since there is an electrical panel there already. In the meantime, I bought a 100' extension cord. It was raining tonight so I didn't try it out. And this is my sad, dark little room. 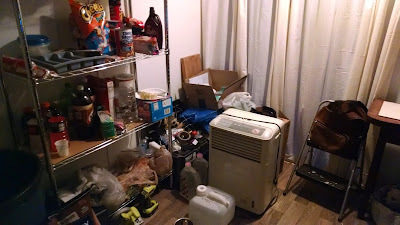 The stuff has been shoved under and on top of the counter so that my 2 mattresses can lie side by side. It is much better than just a twin size. 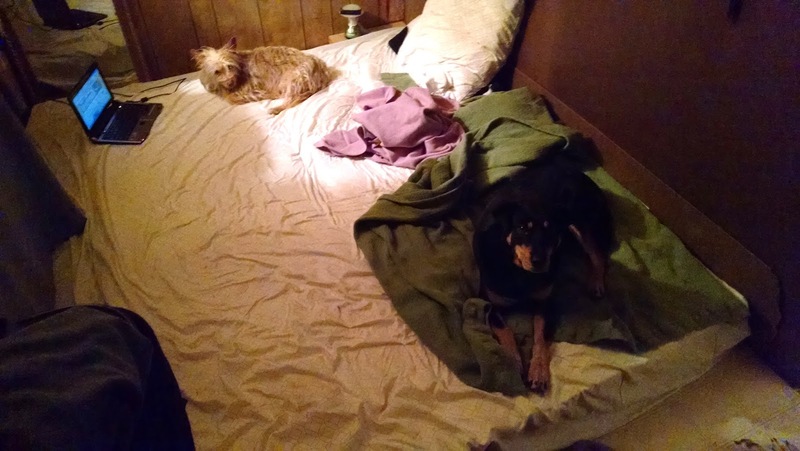 The dogs are bed hogs. Someday I will build a bed frame so that I can have storage under this bed. The dark walls need to go too. It is so dark in here. That's where we are so far. So many half done projects. I'll just keep plugging along a little bit at a time. Daizy, your list of tasks never seems to get done. Now you have another one, a very sad one, due to your father's death. So sorry to hear of your loss. So sorry about your dad. Alzheimer's is the most evil of conditions, stealing people away. Hope your mum is doing okay. Daizy, I am so sorry for the loss of your father. Now that you are living out there, some of the chores will get done a little faster. I agree with Lizzie that you need to paint your walls ASAP. What about building a box frame with posts for a bed frame. You could put plywood down as the support for the mattresses and that would give you some needed storage space under it. Just be sure to support the middle of the bed frame or you will break it quickly. So sorry about your dad. Little by little you'll get everything done. Dave, my to-do list may never get done but I will never get bored. I certainly wasn't expecting a family reunion this weekend though. Lizzie, water to the boy's bathroom is top priority. It is difficult enough to get him to shower without all the complications we have now. Susie B, thank you and yes the getting the bed off the ground is on the priority list but still behind at least 10 other things. Having to buy more wood is a deterrent since I just spent the last of my remodeling fund. Thanks, Kim. It will be interesting to see what I have done in 6 months. Thank you, Anonymous. I am glad he isn't suffering anymore. Thanks, Sam. My father is always on my mind when I work on my projects. I learned so much from him. Whoops. I might have accidentally commented twice. I'm so sorry about your dad. He must have been so proud of your ingenuity and home improvement skills. I'm a long-time reader but I don't comment often. Daizy, I'm so sorry to hear about your father's passing - my condolences to you and your family. He must've been quite the man, to raise such a self-reliant daughter. I pray y'all are comforted by many good memories. Daizy, I've been out of town and not on the internet much for awhile, so I just read this tonight. I'm sorry for your loss. It's so hard to lose a parent. Know that many thoughts and prayers are with your family. Very sorry for your loss Daizy. Hope everyone is holding on alright during this difficult time. I'm so sorry to hear about your dad. My condolences to you and your family.